Making a sports film that’s more about the inner turmoil of its central character than the actual sport itself is hardly a new concept; Raging Bull, Million Dollar Baby and The Wrestler to name a few have all tried and succeeded with that structure, leaving not many others room to stand out or do new things with it. So while Jawbone, a boxing drama by debut director Thomas Q. Napper from a script by its star Johnny Harris, doesn’t initially break new ground, it more than makes up for it by a serious helping of drama and acting that packs a serious punch. Harris plays Jimmy McCabe, a former teen boxing prodigy who’s since fallen on hard times; he’s now a functioning alcoholic who’s within inches of being evicted from his late mother’s flat, which has been marked for demolition. An outburst at a council office leads to an arrest, which shortly after leads Jimmy back to the boxing club he attended as a young lad, to the less than warm reception of gym owner Bill (Ray Winstone) and corner-man Eddie (Michael Smiley). Through connections with his former promoter Joe (Ian McShane), Jimmy scores an unlicensed fight which he begins to train for, but requires the training and support from both Bill and Eddie in order to finally succeed at something for the first time in ages. The absolute best thing about the film, hands down, is the acting. This is an actor’s movie, both figuratively and literally seeing as how Harris serves as both lead and writer on the project; he really gives it his all, from his physical transformation into this gaunt, bald loser to scenes that require him to erupt with all the ferocity of a towering volcano, and Harris presents through his writing a self-destructive character that’s not looking for an easy path to redemption, one that is willing to let himself get beaten to a bloody pulp just to get even with his own bad case of karma. He’s supported by two great turns from character actors Smiley and Winstone, the latter being given an exceptional scene of heartfelt acting that, in an ideal universe, would be the clip they use for his long-overdue Supporting Actor nomination (although, let’s face it, there’s more chance of hell freezing over than the Academy recognising this film, although stranger things have happened…). Harris has undoubtedly written himself and his fellow cast members roles they can really sink their teeth into – even McShane, who despite only having one scene in the film seriously makes the most of his limited screen time – which is fortunate, because these actors and their characters are strong enough to carry this film across its more conventional beats. The plot is as standard as a grimy and gritty boxing drama like this can be, taking the Rocky formula of a major underdog defying expectations to take on a much tougher opponent in the ring, but grounding it so sternly it may as well be covered in concrete. However, this formula – when done right – works for a reason, as it presents us a situation where there is seemingly no hope or chance for victory thanks to the main character’s past decisions or current predicament, and when the climactic fight begins you’re with this character enough to seriously cheer for him as he makes progress in the ring. Napper, who makes a promising debut here, directs these scenes with such ferocity and quick-cut editing that is smooth enough to still make out what exactly is going on, and doesn’t gloss over the bloodier aspects of these kind of fights either. He also succeeds at giving you enough time to get to know this character and, though Harris’ exceptionally committed performance, make you root for a guy who could so easily have been detestable with a lesser actor and filmmaker in charge. While it would be a lie to say that Jawbone is a game-changer when it comes to intense boxing dramas such as this, it works with the proven formula well enough to make it a compelling watch, and is carried by strong direction, solid writing, and of course some seriously excellent performances all around to give you an enlightened sense of relief that, no matter how tired and clichéd a lot of lesser films in the sports genre can seem, there are still some people out there that are willing to give their all to something we know like the back of our glove-covered hand. 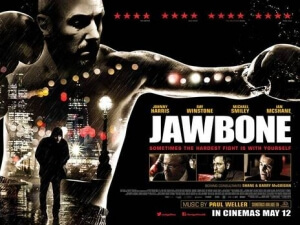 Jawbone may stick close to the boxing drama formula, but it’s carried all the way through by strong direction by debuting filmmaker Thomas Q. Napper, a strong script by lead actor Johnny Harris, and exceptional performances from its talented ensemble of character actors, with Harris and Ray Winstone being particularly fantastic here.